One of the points of the Story of Electronics film is that the electronics manufacturers should direct their designers to focus their talents for innovation on solving some of the challenges with electronics products, which currently use many toxic chemicals in the production and in the products themselves, which are not made to be easily recycled, and which are not made to last and are often difficult to repair and upgrade. Here are some examples of designers that make us hopeful that designers really can solve some of these problems. It began as a student thesis project at the University of Houston, but the response was so overwhelmingly positive, that they’ve now put this into production. The Recompute PC replaces the plastic casing for a desktop PC with sideways layers of corrugated cardboard, making it fully recyclable. The design allows for easy disassembly of the case and removal of the components without any tools. 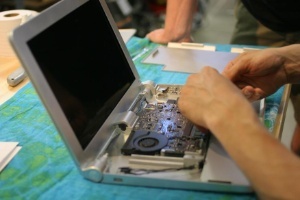 A group of Stanford University students have won a design award for their easy-to-disassemble laptop called the Bloom Laptop. They received the Inventor of the Month Award in October 2010 from Autodesk, whose design software was used to develop the laptop, which can be taken apart for recycling in two minutes, using no tools. The laptop is only a prototype and not in production.